Pittsburgh’s northside has a rich history, much like the cupcake that bears its name. At the Priory Fine Pastries, the Northsider is a tribute to D. L. Clark and the Clark Bar Company. This yellow cupcake has a peanut-butter-cream frosting on top and in its center. The cupcake is finished with a light chocolate drizzle and some Clark Bar pieces. It is scrumptious! 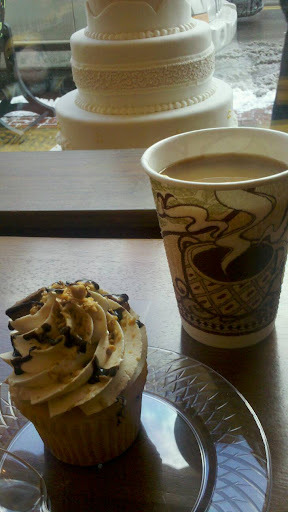 With the nutty notes in the cupcake, the hazelnut coffee I ordered to accompany my dessert was a perfect pairing. After reading deeper into the history of the Clark Bar, Clark bars were produced and made popular through their company which was located in Allegheny, Pennsylvania, now a part of Pittsburgh’s northside. This was my first time eating in the bakery shop located on East Ohio Street, just a short walk from Bistro To Go. I had however, ordered desserts for the Summer Luau Wine Exchange back in August and they were a huge hit as well. If anyone is in need of high quality baked goods, check out Priory Fine Pastries for their specialty items, like the Northsider, or speak with someone like I did in August to do a custom offering.